In the history of the NBA, there have been many great players. There have been many legendary players. However, there has only been one Superman, one Big Aristotle, one Diesel, and one Shaquille O’Neal. Shaq daddy stood at an immaculate seven feet, one inch. He began his NBA career as the number one overall selection by the Orlando Magic in the 1992 Draft. After dominating college basketball with the LSU Tigers, O’Neal leaped to the top of the NBA. He was the Rookie of the Year in the 1992-93 season. 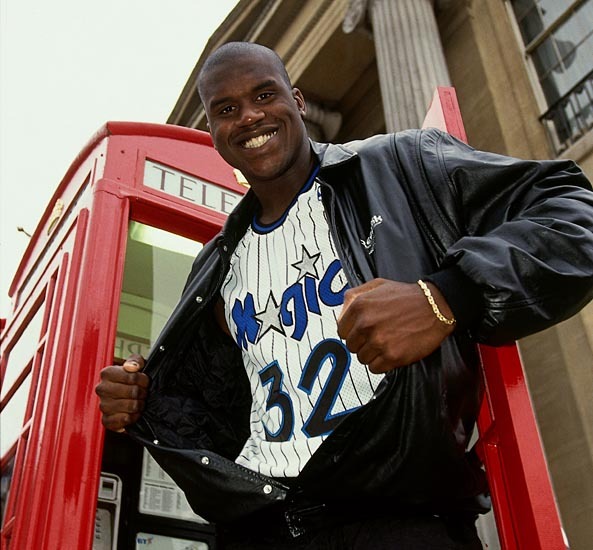 In his four years as the face of the Magic, O’Neal began his legacy as one of the best big men in the game. He then took his talents to Los Angeles. Like two of the greatest centers to play the game before him, Wilt Chamberlain and Kareem Abdul-Jabbar, Shaq became the centerpiece of the Lakers. With Kobe Bryant by his side, the Big Diesel won three NBA Titles in 2000, 2001, and 2002. In 2004, the man who had already established himself as one of the greatest to play the game moved to South Beach and became a member of the Miami Heat. With Dwyane Wade, O’Neal led the Heat to the 2006 NBA Title. O’Neal’s playing time would decline as injuries began to take their toll on him in the years after his fourth and final NBA Title. Shaq would go on to play for the Phoenix Suns with Steve Nash and then with LeBron James on the Cleveland Cavaliers before coming to Boston, the former stomping grounds of arguably the best big man of all time, Bill Russell. After his one season playing for the Boston Celtics, O’Neal announced his retirement. At the end of the day, O’Neal’s resume includes one MVP Award, four NBA Titles, 15 All-Star games, three NBA Finals MVPs, and two scoring titles. He has the fifth most points and field goals in NBA history. He also has the 12th most rebounds and ranks 7th in blocks. He also has an Olympic Gold Medal from the 1996 games in Atlanta. The Los Angeles Lakers have revealed that they intend to retire the number 34 worn by O’Neal in his years with the team. Outside of the NBA, O’Neal released four hip hop albums, starred in movies, and even had a pair of television programs in addition to guest starring on countless others. One of O’Neal’s biggest musical moments came when he was able to rap on a Michael Jackson track, “2 Bad,” for Jackson’s HIStory album. O’Neal is in possession of an MBA, a BA, and is in the process of earning his Ph. D.
Shaq, in addition, has a deep history with law enforcement, working with numerous police departments throughout his NBA career. The Big Daddy’s humor is well known. He was a media favorite. His interviews were highly anticipated as his comments were always worth catching. Without question one of the greatest to play the game, Shaquille O’Neal will not soon be forgotten.